The European Union is a legal system unlike any other in history. It is also facing unprecedented challenges, controversies and uncertainty as the UK seeks to implement Brexit. 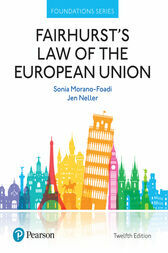 At its heart, Law of the European Union aims to shed light on this unique forum by providing a clear and accessible overview of the constitutional arrangements of the Union, and the law and jurisprudence which underpins the substantive areas of core EU Law. Streamlining its coverage to focus only on the constitutional law of the EU and the core substantive areas of free movement of people, workers and goods to reflect the typical LLB syllabus. Expanding coverage of direct effect, fundamental rights and the division of competences to provide more detailed information on these topics. Increasing the level of debate and analysis providing more nuanced coverage of the subject enabling the student reader to reflect on broad, underlying issues or controversies. Incorporating a range of new or improved features and diagrams to support learning including case boxes which explicitly highlight the facts, ruling and significance of each case discussed and reflection boxes which draw attention to key issues, discussion points and future possibilities. Weaving coverage of Brexit throughout.